Fully-adjustable bedding sleeves are easy to install and fit nearly all types and sizes of rifle stocks. 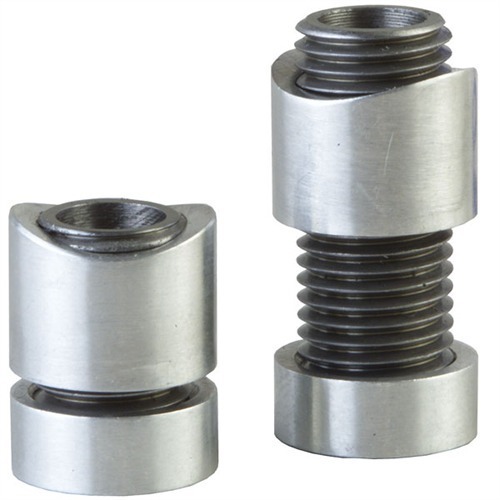 Lightweight, pre-contoured adjustment rings move on a fully threaded shaft so you can size them for an exact fit without additional, time-consuming cutting, filing or machining. Sold as a pair, long for Rear screw, short for Front screw. SPECS: Sleeve - steel, .296" (7.5mm) ID, 7/16"-20 tpi. Adjustment Ring - aluminum, .560" (14mm) OD. Front - .700" (17mm) long. Rear - 1.16" (2.9cm) long. Installation requires alterations to stock and synthetic bedding. Sold as pairs only. Fullt justerbare senger ermene er enkel å installere og passer nesten alle typer og størrelser av rifle aksjer. Lett, pre formet justering ringer flytte på en fullt gjenger aksel slik at du kan skalere dem for en eksakt passform uten ekstra, tidkrevende skjæring, innlevering eller maskinering. Selges som et par, etter bak skrue, kort for foran skruen. Spesifikasjoner: ermet - stål,. 296"(7.5 mm) ID, 7/16"-20 tpi. Justering Ring - aluminium,. 560"(14mm) OD. Front -. 700"(17mm) lang. Bakre - 1.16"(2.9 cm) lang. Installasjonen krever endringer til lager og syntetiske sengetøy. Solgt som parene bare. I used these to pillar bed a pre 64 Winchester. They are great for someone who is doing a home job. They adjust a little to easy and would move when being placed in the hole. A dab of grease on the thread where the nuts are sitting will help. Make sure you have the correct size Forstner bit. I could not find a single local store that carries this size (9/16). If I could do it again I would get the piloted Forstner bit sold by Brownells (Stock #:080-909-000WB). It is not cheap, but it cost the same as a local machinist charged me to drill the holes in my stock. You could do it with a hand drill at home but these holes must be perfectly straight or you are defeating the purpose. I recently used these for the first time on a Win Model 70 Super Grade, CRF, made in the 80's out of the CT plant. I have used Brownell's Acraglass Gel with steel ferrels for pillars for years on other rifles, but decided to try these adjustable pillars for this project. As the previous reviewer stated, getting the holes drilled precisely is critical. I used a 1/2" bit, then a Dremmel tool to enlarge the holes, so that the pillars just slid in an out of the stock. This allowed me to adjust them precisely before gluing in place and making the final adjustments to the sleeve. What is so great about this product is that you can precisely adjust the pillars to get the action of your rifle to lay perfectly in the stock with a perfect free float. Of course then I glass bedded the action, tang, and floor plate area. If you take your time, the product is very easy to use and the results will astound you as to how accurate a factory rifle can be when bedded properly. Adjustable Pillar Bedding Sleeve Fullt justerbare senger ermene er enkel å installere og passer nesten alle typer og størrelser av rifle aksjer. Lett, pre formet justering ringer flytte på en fullt gjenger aksel slik at du kan skalere dem for en eksakt passform uten ekstra, tidkrevende skjæring, innlevering eller maskinering. Selges som et par, etter bak skrue, kort for foran skruen.